CHARLOTTE, N.C. — It didn’t take Kyle Korver long to knock down a 3-pointer in his first game back with the Jazz. The 37-year-old guard, who was traded from the Cavaliers back to Utah earlier this week, checked into his team’s matchup against the Hornets on Friday with 4:54 to play in the first quarter. 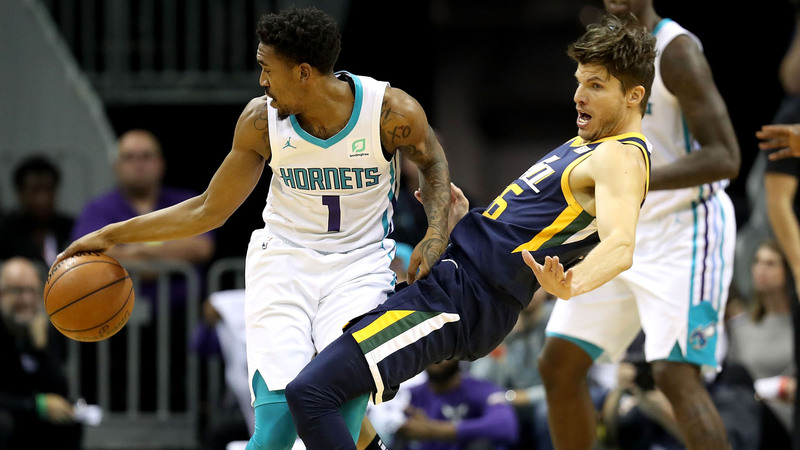 Less than 15 seconds later, Korver received a short pass from Rudy Gobert, took one dribble and drilled a shot from behind the arc over the outstretched arm of Hornets center Frank Kaminsky. The sharpshooter finished the Jazz’s 119-111 win with 14 points and two rebounds. He hit four of his six 3-point attempts in 22 minutes on the floor. Utah entered the game in Charlotte shooting just 31.9 percent from 3-point range, which ranked 28th in the NBA. Gobert said Korver should help open up the team’s offense. “I’m trying to do my best to screen for him and get him open,” said Gobert — who registered a double-double in the victory with 20 points and 17 rebounds. “It’s kind of like automatic. It’s fun to watch and fun to be a part of. The Jazz has had an up-and-down start to the season after it finished 2017-18 with a 48-34 record and advanced to the Western Conference semifinals. Korver, however, said he has been impressed by the team’s chemistry so far.